97% of men survive melanoma skin cancer for at least one year, and this is predicted to fall to 88% surviving for five years or more, as shown by age-standardised net survival for patients diagnosed with melanoma skin cancer during 2010-2011 in England and Wales. Survival for women is slightly higher, with 98% surviving for one year or more, and 92% predicted to survive for at least five years. Melanoma skin cancer survival falls only slightly beyond five years after diagnosis for men, and does not continue to fall beyond five years for women, which means most patients can be considered cured after five years. 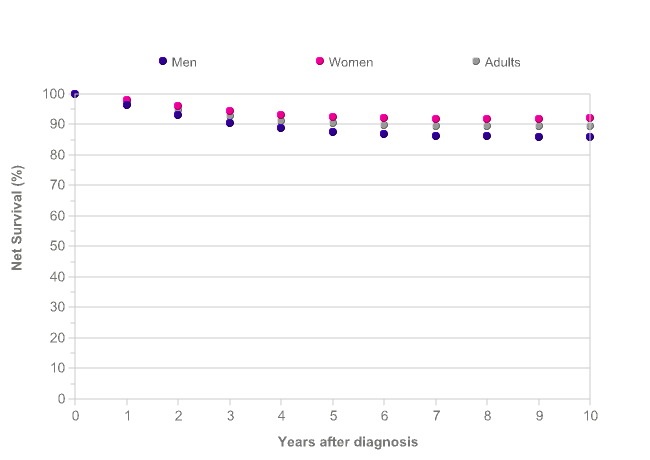 86% of men and 92% of women are predicted to survive their disease for ten years or more, as shown by age-standardised net survival for patients diagnosed with melanoma skin cancer during 2010-2011 in England and Wales. Out of 20 common cancers in England and Wales, ten-year survival for melanoma skin cancer ranks 2nd highest overall. Survival for melanoma skin cancer is reported in Scotland and Northern Ireland,[2,3] though it is difficult to make survival comparisons between countries due to different methodologies and criteria for including patients in analyses. Five-year survival for melanoma skin cancer generally decreases with increasing age. 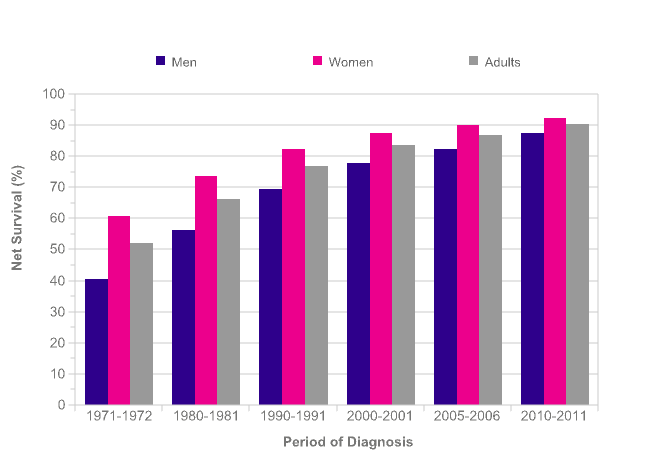 Five-year net survival in men ranges from 91% in 15-39 year-olds to 82% in 80-99 year-olds for patients diagnosed with melanoma skin cancer in England during 2009-2013. 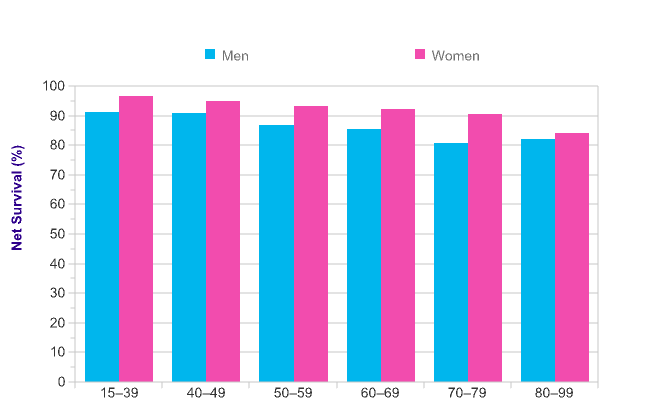 In women, five-year survival ranges from 97% to 84% in the same age groups. Five- and ten-year survival has increased by an even greater amount than one-year survival since the early 1970s. Five-year age-standardised net survival for melanoma skin cancer in men has increased from 40% during 1971-1972 to a predicted survival of 88% during 2010-2011 in England and Wales – an absolute survival difference of 47 percentage points. In women, five-year survival has increased from 61% to 92% over the same time period (a difference of 32 percentage points). Ten-year age-standardised net survival for melanoma skin cancer in men has increased from 35% during 1971-1972 to a predicted survival of 86% during 2010-2011 in England and Wales – an absolute survival difference of 51 percentage points. In women, ten-year survival has increased from 55% to 92% over the same time period (a difference of 38 percentage points). Overall, 9 in 10 people diagnosed with melanoma skin cancer today are predicted to survive their disease for at least ten years. MacKie RM, Bray CA, Hole DJ, et al. Incidence of and survival from malignant melanoma in Scotland: an epidemiological study. Lancet 2002; 360:587-91. 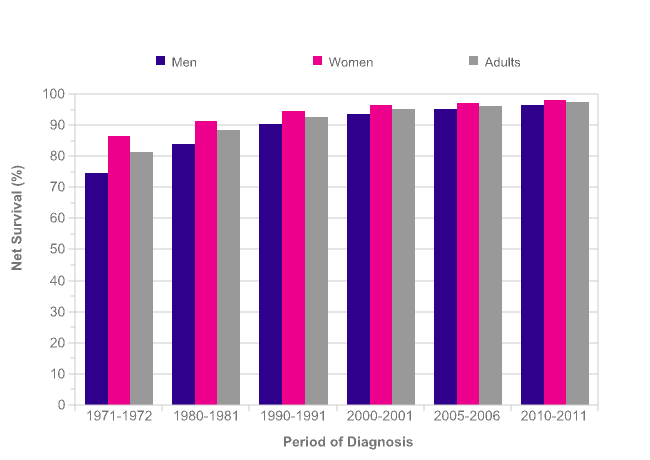 Downing A, Newton-Bishop JA, Forman D. Recent trends in cutaneous malignant melanoma in the Yorkshire region of England; incidence, mortality and survival in relation to stage of disease, 1993-2003. Br J Cancer 2006; 95:91-5. Murray CS, Stockton DL, Doherty VR. Thick melanoma: the challenge persists. Br J Dermatol 2005; 152:104-9. Survival for melanoma skin cancer is strongly related to stage of the disease at diagnosis. One-year net survival for melanoma skin cancer is highest for patients diagnosed at stage I, and lowest for those diagnosed at stage IV, 2014 data for England show. 101% of patients diagnosed at stage I survived their disease for at least one year, versus 50% patients diagnosed at stage IV. One-year net survival for unknown stage melanoma skin cancer is 93%. Lack of staging information may in some cases reflect advanced stage at diagnosis: for example very unwell patients may not undergo staging tests if the invasiveness of the testing outweighs the potential benefit of obtaining stage information. One-year net survival is similar between males and females at all stages. Net survival can be greater than 100% because it accounts for background mortality. Net survival greater than 100% indicates that patients in this group have a better chance of surviving one year after diagnosis compared with the general population. Five-year survival for melanoma skin cancer shows a much more gradual decrease in survival between Stages I and IV. 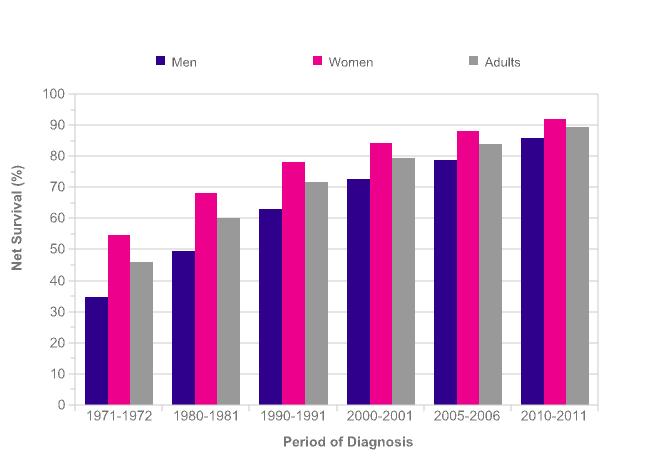 In men, five-year relative survival ranges from more than 100% at Stage I to 8% at Stage IV for patients diagnosed during 2002-2006 in the former Anglia Cancer Network. 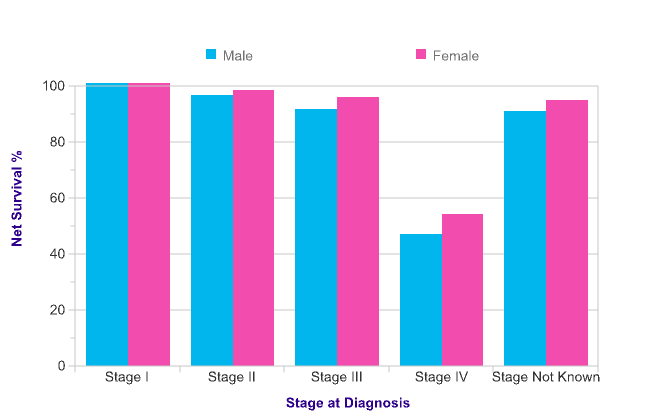 In women, five-year survival ranges from 100% at Stage I to 25% at Stage IV. 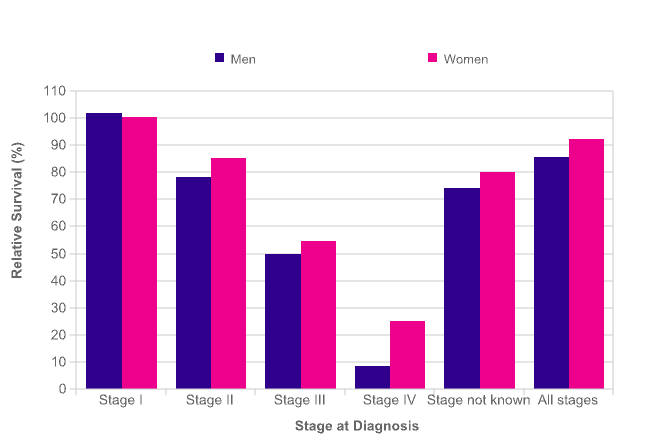 There are no significant differences between men and women at any of the stages for both one- and five-year relative survival for melanoma skin cancer. Five-year relative survival for melanoma skin cancer in men in England (81%) is above the average for Europe (79%). Scotland (84%) and Northern Ireland (86%) are also above the European average but Wales (74%) is below the European average. Across the European countries for which data is available, five-year relative survival in men ranges from 41% (Bulgaria) to 89% (Switzerland). Five-year relative survival for melanoma skin cancer in women in England (89%) is above the average for Europe (87%). Scotland (92%) and Northern Ireland (95%) are also above the European average but Wales (85%) is below the European average. 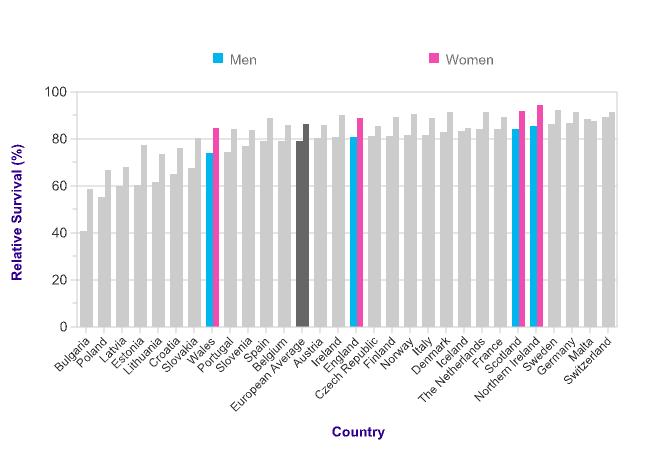 Across the European countries for which data is available, five-year relative survival in women ranges from 59% (Bulgaria) to 95% (Northern Ireland). Data is for: 29 European countries, patients diagnosed in 2000-2007 and followed up to 2008, melanoma of skin (C44.0-C44.9).